Fields of Green is an AHRC funded research project exploring the sustainability of Scotland’s music festivals through the eyes of artists, audiences and festival organisers. In his opening remarks at the September 2014 United Nations Climate Change Summit in New York, UN Secretary-General Ban Ki-moon stated unequivocally: “climate change is the defining issue of our time. It is not a distant threat. It is coming and approaching much, much faster than we may think … All of us have a stake in this fight and all of us can make a difference. Every action counts, large and small.” Ban stresses the importance of tackling a global problem with local action, and this project takes up that challenge by addressing climate change through music festival communities. Fields of Green is a one year research project (April 2015 – April 2016) funded by the Arts and Humanities Research Council exploring the environmental sustainability of Scotland’s music festivals and their capacity to enable ‘greener’ audience behaviours within the temporary communities formed during such events. The project aims to lay the foundations for a future community of practice of music festival organisers and artists working together towards a greener Scotland. Project partners draw from a range of disciplines and backgrounds including sociology of music (Matt Brennan, University of Edinburgh), urban planning and environmental management (Angela Connely, University of Lancaster, creative practice and songwriting (Jo Collinson-Scott, University of the West of Scotland) and arts and sustainability organisation (Gemma Lawrence, Creative Carbon Scotland). 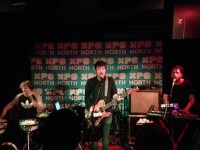 The project focuses on two Scottish music festival case studies – XpoNorth and Solas Festival – in order to develop sustainable development research and support actions enacted by live music festival organisers to encourage audiences to engage with and enact sustainable behaviours themselves. Alongside this, research will be conducted with a number of Scotland-based singer songwriters to explore themes of travel and sustainability within individual artists’ lives and practices. Songs devised by artists will be recorded on a digital EP and launched at Celtic Connections in February 2016.